Opera has introduced yet another new feature for its multifunctional browser. 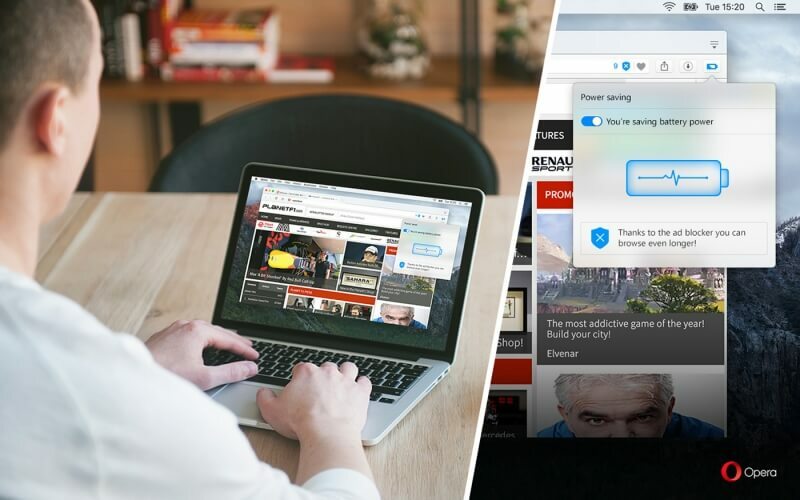 After the company revealed a built-in VPN in April, and its integrated ad-blocking technology got a stable release last week, the Norwegian firm has just unveiled a power-saving mode that will let users browse for longer. The company claims that its new feature will be able to extend a laptop’s battery life by 50 percent compared to using other browsers such as Chrome, Firefox, and earlier versions of Opera. Opera’s figures come from tests performed on a Lenovo X250 laptop, running Windows 10 with a Core i7 processor and 16GB of RAM. The company opening up 11 “popular websites,” scrolled through each one five times, left them for a minute, closed the tabs, then repeated the process until the battery died. Opera claims that the laptop lasted 1 hour 54 minutes when performing the experiment with Chrome. When used with Opera’s power-saving mode, it ran for 2 hours 56 minutes. Once a laptop has been unplugged from a power source, the icon for the power-saving mode appears as a small battery in the browser’s top right corner. Clicking on it will bring up a settings menu where the feature can be toggled on and off. Additionally, once the browser detects that a laptop’s battery is running low, it will suggest enabling the mode to conserve power. There’s no word when the power-saving mode will be rolled out to everyone. It took two months for the ad-blocking tech to move from the developer edition to a stable desktop release, so the new feature could arrive sometime in July.